Hello! 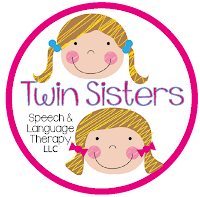 This is Manda Riebel and Shanda Gaunt from Twin Sisters Speech & Language Therapy LLC. We are super excited to announce that we are now collaborators for Speechie Freebies! We are always making freebies to share with our fellow SLP's and others and now we have another sharing site in order to do that special task even better. 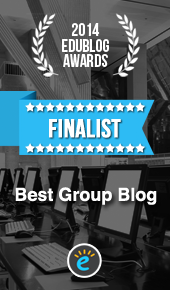 We would like to thank all of our fellow collaborators for the warm welcome and would also like to say that we are very excited to share in this wonderful blogging adventure with you all! Please know that Shanda and I are primarily themed based therapists that strongly believe that speech-language pathologists should not only work on articulation, but also on advancing language and literacy skills too. We both have specialties. 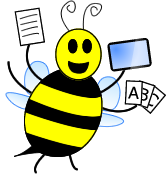 Shanda is great with the fluency clients and that super adorable 0 to 3 population. Manda is great with the lispers and the Pre-k to middle school populations and has a lot of experience working with adults too. We both enjoy all types of therapy though and direct sessions centered on advancing voice, verbal expression, cognition, language and swallowing skills almost every day! Most of our therapy sessions are based on a fun seasonal, occupational or holiday based theme and this first posting at Speechie Freebies will be one geared towards having a ton of fun for Groundhog Day while targeting the articulation of sounds at the initial and final positions of words! Groundhog Day is a fun holiday to recognize and this articulation activity will be a great way to start talking about it. 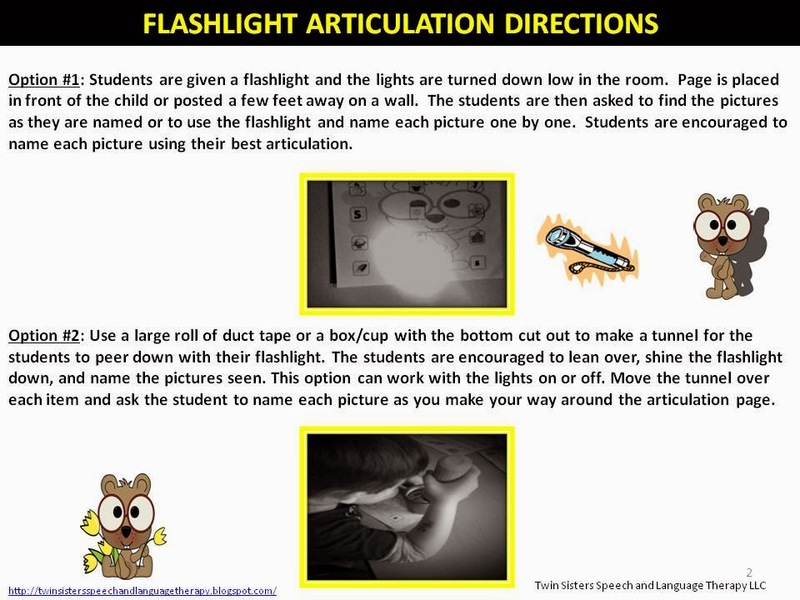 The main activity encourages the use of a flashlight to find and to label pictures that contain the words with the initial and final sounds of k, g, f and p.
Also, another activity encourages the student to use their flashlight to locate objects in the room and to discuss if a shadow was created or not. The student is asked to describe each shadow once made. Kids love to use flashlights and that is all you will need to get in order to make this activity work in your own kitchen, therapy room or classroom! 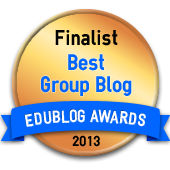 We hope that you and your students have a blast targeting articulation in this different way. We strongly think that articulation therapy should be both useful and fun! Have a happy Groundhog Day and have a terrific time making shadows and finding pictures with these FREE Groundhog Day Themed therapy sheets! 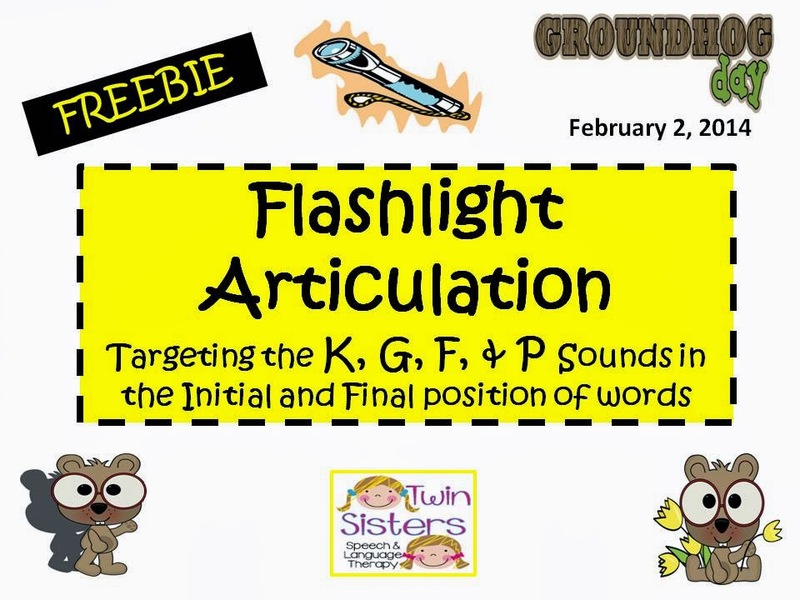 Please click on this link in order to grab your own FREE COPY of Groundhog Day Flashlight Articulation! Valentine's Day Synonyms or Antonyms?! Valentine's Day Compare & Contrast Fun! Snow Day Language Fun FREEBIE!